How can we use emerging technology to positively impact food production and ensure a sustainable future? Niwa is a visionary company aiming to do just that: by building a smart connected platform, enabling users to grow food anywhere using a smartphone. Niwa's mission is to get the world growing by creating tools which are smart, simple and fun to use, bringing the professional gardening knowledge at everybodys fingers. With a strong belief in community and collaboration, they envision a future where individuals, business owners, schools, farmers and whole countries are able to grow everything they need at easy to live their healthiest and happiest lives, regardless of time, knowledge, or location in a way that is good for our environment. Agnieszka Nazaruk, Founder of Niwa, will be speaking at the Future of Food Production workshop, on 21 Ocotober during London Food Tech Week. We caught up with her ahead of the event to hear more about the founding of Niwa and their plans for the future. What was the motivation behind founding Niwa? We all eat every day but most of us don't know where our food comes from and what's in it but even fewer knows how harmful, resources heavy and unsustainable is the way we produce and distribute our food. Starting with the massive use of land - we use an expanse the size of Africa at the moment, yet produce only ⅓ of what we could be from that size of area - which causes ⅓ of all soil in the world to be degraded and unsuitable to grow anything on; to using 70% of our fresh-water resources, and 2-3 times more than is actually needed to feed the plants; to being the biggest contributor to climate change. From the time food is grown, processed and delivered to the end customer it travels, on average, 1500km, releases tonnes of CO2, and also acquires over 400 different chemicals, while it loses most of its nutritional value. We have seen the rise of agtech revolution, a big shift towards local food production, but also a rise in solutions to empower people to grow right where they are, through urban and indoor farming. Hydroponics, a soilless way to grow plants, has been a huge part of it. My cofounder Javier lived in Almeria, a little city on the south of Spain. For us in Europe most of our produce comes from Almeria, where thousands of hydroponic greenhouses produce huge amounts of fruits and vegetables every day. Seeing the problem and at the same time inspired by the technology right at his doorstep, Javier had the idea of bringing the power of this technology to the masses. Since then the idea evolved a lot over time, to eventually become what we are working on at the moment: a way to enable everyone to grow their own food from their smartphone, hyper-locally. An open, operating system for all hydro-, aqua- or soil-based growing, which will democratize food production. What do you feel has been essential to the success of Niwa so far? I think our ability to listen to the market. We launched with a physical product, the Niwa ONE - it was our proof of concept but we needed to get it to the market to start building the community and start listening to what people really needed. As we dove deeper into food system conversations it became obvious that to create a system which produces enough, and that everyone can use regardless of their expertise, will lie mostly in the operating system. And if we can crack that, we can truly make an impact. How can the technology and ethos behind Niwa be applied in other areas? We are creating tech which we hope will redefine gardening in urban areas, that will bring a new wave of what is possible and empower individuals to take responsibility and control over what they eat. And I also mean for restaurants, cafes, business owners, small urban farmers and obviously ordinary people. I think we feel responsible for our future and we believe that we can make it better. Behind the company vision there are strong beliefs in the power of community and bringing people together, in educating and inspiring people and truly taking control over their health. We build tools to make that happen and that’s the message we want to bring to the world. What do you see in the future for Niwa? I think that sooner than we think we will be buying a house with a growing system, that is built in standing right next to our fridge. It will be very easy and fairly inexpensive to set up a hydroponic system in your back garden, in your office or in your cafe. 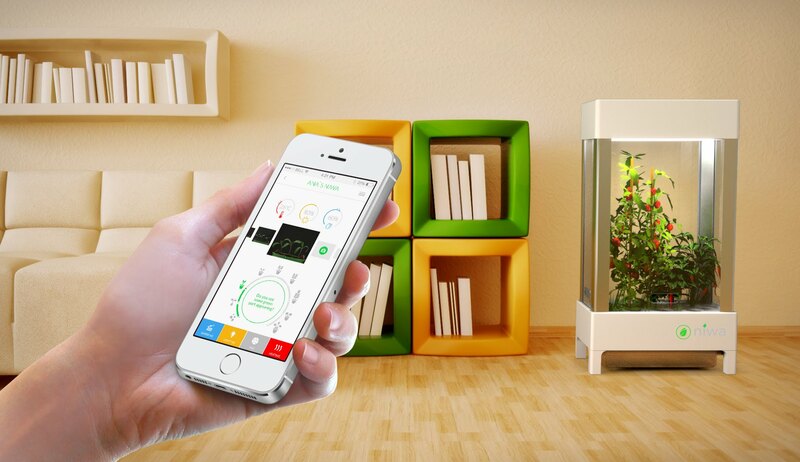 We hope that Niwa will become an operating system for any growing system - regardless whether it's hydroponics, aquaponics or soil-based growing - and will ultimately democratize farming and gardening knowledge, and bring it to the masses. And that is already starting to happen, as we are looking into licensing the technology to a variety of companies, like developers of smart homes who will be able to use it as a part of their offering. What in your opinion are the most pressing issues within Food Production? How can these be solved using technological or scientific breakthroughs? There are many, and those issues are very complex. A lot of them require policy makers, governments, corporations and innovators to work together to address them. There is no simple answer to fixing our food system and it needs to happen on multiple levels. The future looks exciting though. We have an army of innovators, startups and advocates working on bringing variety solutions to the market. One of the issues we are addressing is moving some of our industrial food production to not only the local, but the hyper-local community, and building the tools to make that happen. This on its own can significantly reduce both environmental impact and move us towards more sustainable solutions. Educating and inspiring people about healthy food, gardening and hydroponics will play a big role in shifting the mindset and empowering individuals as well. Agnieszka Nazaruk will be speaking at the Future of Food Production workshop on 21 October, a London Food Tech Week event. For more information and to register, visit the event page here.